First Nerve: “A Little Touch of Paris”? 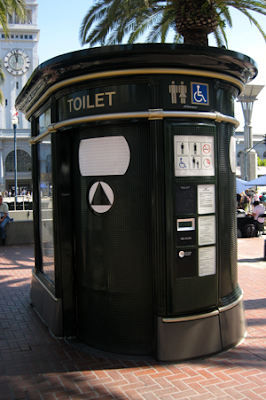 Public Toilet Failure in S.F. 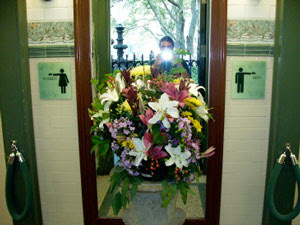 There are automatic single loos in London, but I've never dared use one. My issue was with the 'automatic' part, as they apparently turn upside down to clean themselves. I wouldn't trust 'em not to do that while I was in there! It never occurred to me that they could be dirty, though. I share your misgivings about automated toilets. One time on an Air France flight, the extreme vacuum-flushing action of business class head almost pulled the glasses off my face. Close call. And why deny yourself the pleasures of the pissoir? Pioneer olfactory researcher Max Mozell invented a “Women’s urine conducting apparatus” (U.S. Patent 4,771,484) that lets you pee standing up.